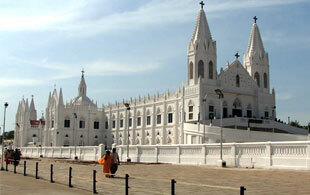 Velankanni Tour is centered on the holy shrine of Velankanni Basilica. Dedicated to the Lady of Good Health, Velankanni Church is often referred to as the “Mecca of South Asian Christianity” in Tamil Nadu. The shrine is considered sacred as the lady performed miracles on this sacred site. Besides the visit to this shrine, the journey also takes a visitor through the splendid churches in Chennai and Pondicherry, along with a visit to the world heritage site in Mahabalipuram. Upon arrival at Chennai airport, check in the hotel for overnight stay. Later visit the city's prominent churches including the visit St. Mary's Church (the oldest British building in India), Little Mount and St Thomas Mount. Little Mount is believed to be the site where St Thomas lived in hiding around AD 58 (Chinnamalai). Three kilometres on, St Thomas Mount (Parangi Malai) is thought to be the site of Thomas' martyrdom. Return to the hotel for dinner and overnight stay. Check out Chennai and drive to Mahabalipuram and check in the hotel here. This is renowned as a world heritage site for stone temple and open air bas reliefs belonging to the illustrious Pallava era. Visit the world heritage site of Mahabalipuram or Mamallapuram famous for rock bas reliefs and sculptures. The Sea Shore Temple here offers a great captivating site. Here, the sanctums are dedicated to both Lord Vishnu and Lord Shiva. Overnight in Mahabalipuram. Check out Mahabalipuram for Pondicherry, a former French colony, now a great tourist attraction filled with many wonders. Upon arrival here, check in the hotel. Continue the tour through Pondicherry with a visit to its churches. Visit the Basilica of the Sacred Heart of Jesus, established by the French missionaries in the 18th century. 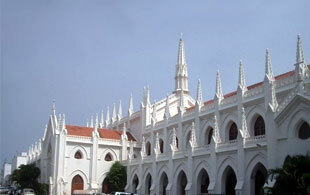 In recent years, the church has become one of the famous pilgrimage spot for Christians in Pondicherry. The Eglise de Notre Dame des Anges (The Church of Our Lady of Angels) is prominent for its masonry, which used the finest of limestone mixed with white of the egg and gave it a rich texture identical to that of a white marble. Modelled on the Basilica at Lourdes in southern France, this church also forms one of the must visit attractions in Pondhicherry. The next attraction to be experienced during the territory’s tour is the visit to Auroville, the township established by the mother for harmonious living. Return to the hotel for dinner and overnight stay. Check out Pondicherry and drive to Velankanni via road and upon arrival, check in the hotel. Day is free at leisure. Dinner and overnight at hotel. After breakfast, visit Shrine Basilica of our Lady of Health, the principal shrine at Velankanni. This is the place of our Lady’s apparitions and is famed for the three miracles performed by the lady of good health. Located on the shore of the Bay of Bengal, this coastal village attracts Christian pilgrims from the world over. Rest of the day is free at leisure. Check out Velankanni and begin a drive to Chennai. Upon arrival, continue to airport to board the flight for connecting destination.